Building a model active volcano can be fun. It’s a great way to keep the children busy over school breaks and a classic science fair project. Volcanoes can be classified in 3 forms: caldera, shield and composite volcanoes. Caldera volcanoes are the most dangerous and largest of all the volcanoes. Yellowstone National Park was the result of a caldera volcanoes activity about 600,00 years ago. Shield volcanoes are common to places like Hawaii and spew magma from a central vent. Composite volcanoes have the cone shape we all associate with volcanoes. Mt. Vesuvius and Mt. Saint Helen are composite volcanoes. Making a model volcano at home is easy. Here’s how. In a large mixing bowl combine the 6 cups of white flour with 2 cups of table salt. Mix well. Add 4 TBSP cooking oil to the flour and salt dry mixture. Add 2 cups water to the flour mixture to make a dough. Mix the dough well. Place your 2 liter soda bottle in the center of your aluminum roasting pan. Make sure the top is secure on the bottle. You don’t want any dough to get placed inside the soda bottle. Take the dough mix and shape it around the bottle. This creates the cone shape desired for the volcano. If you do not have enough dough to cover the bottle, then make more dough following the previous steps. After the bottle is covered with dough, allow it to sit out and fry overnight. After the volcano is completely dry, remove the bottle top from the soda bottle. Add cups of warm water carefully into the bottle. Be careful not to get the dough wet. Add 10 drops of red food coloring to give the effect of magma when the volcano erupts. We need to add 10 drops of liquid detergent to the water. This will also help to create the appearance magma. Add 2 TBSP of baking soda to the mixture. You need the baking soda as a erupting agent. This is the explosive, or erupting part. Add 1 cup of vinegar. 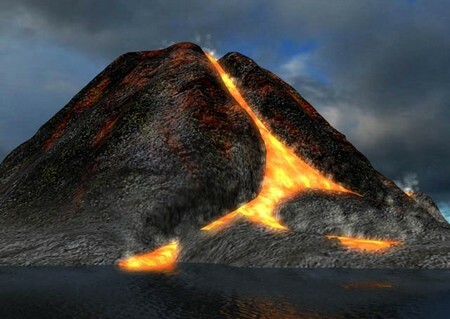 The baking soda and vinegar combines will react and cause magma to flow from your volcano.